A.W. Tozer’s great book, The Pursuit of God, was one of the first Christian classics I was introduced to in college. The past few weeks I have been on a quest. I want my tastes changed for the Kingdom of God. I want to THIRST again. The whole transaction of religious conversion has been made mechanical and spiritless. Faith may now be exercised without a jar to the moral life and without embarrassment to the Adamic ego. Christ may be ‘received’ without creating any special love for Him in the soul of the receiver. A man is ‘saved,’ but he is not hungry nor thirsty after God. In fact, he is specifically taught to be satisfied and is encouraged to be content with little. I can understand being content with “little” in this world. This world just can’t satisfy. But to be content with “little” from God is just crazy. Yet, that has been my life. I need a new thirst. It’s been a while since I’ve posted a book review and I wanted to quickly share a few thoughts about a great new book I was given on engaging our culture as a Christian ambassador. 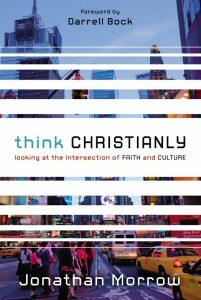 It’s calledThink Christianly: Looking at the Intersection of Faith and Culture by Jonathan Morrow. If we’re going to engage well, we’ve first got to get the culture and then we’ve got to get how to impact it for the cause of Christ. This book is a totally accessible primer in doing just that, moving our thinking from isolation to integration. Part One talks about how pop culture teaches people and shapes our worldviews. This section challenges us to engage rather than hide, to be Christ’s ambassadors wherever we are. Part Two is called “preparing to engage,” including practical advice from Paul Copan, Scott Klusendorf, Sean McDowell and others. I really appreicate the Web sites, DVDs and books listed at the end of each section. I’ve discovered some good stuff in there I had never seen before. Jonathan concludes with a section called “Imagine if.” Here, he communicates the vision for breaking down the stereotype of the church being intolerant, unintelligent and out of touch. What if the church became the place where people turned for real answers to life’s toughest questions? This book will inspire you to train our brothers and sisters to Think Christianly and equip them to engage the culture. Live a normal Christian life? None of us are normal, even after we are Christians-if we mean by that being perfect. What is possible, however, is for us to live in the fullness of life in the circle of who we are, constantly pressing on the border lines to try to take further steps. This is not done in our own strength, but looking to the Lord moment by moment as well as day by day. One of the problems is simply that the church doesn’t talk a lot about it. Apologetics is generally understood to be a specialty discipline– specifically engaging in defending the faith against skeptics, alternate religions, cults, and contrary worldviews. As such, many pastors feel that it can only play a very limited role in ministering to the needs of their congregation. How does apologetics help the man trying to feed his family after losing his job or the newly widowed woman?I’ve said before that in many churches, a person telling his or her pastor of their desire to start an apologetics ministry results in an experience similar to a young man telling his Jewish mother he wants to be a proctologist. “Well, I glad you’re going to be a doctor,” she would say, “But why did you have to choose that!” Pastors are happy to have people desiring to get into ministry opportunities, but they simply aren’t sure where apologetics fits in their church. However, many times both church leadership and laity fail to understand the more holistic aspects of providing a strong apologetics ministry to the local congregation. In this article, I’d like to highlight two benefits of an apologetics ministry that applies directly to every member of the church, benefits that you may not have considered before. The word apologetics literally means providing reasons and evidence for the Christian faith. Part of this means defending the Christian faith from imposters or detractors, but it also means protecting those in the church from the wolves dressed in sheep’s clothing. One can define apologetics as theology properly applied and there is no greater need to apply theology properly than with new believers. The Burned-Over district is a good example. Historian John Martin notes that in what was then a formidable frontier, the area of upper western New York in the early 1820s was attracting people coming from the more established eastern seaboard cities. New immigrant populations also flooded the area seeking land and jobs. Many preachers would travel throughout the area holding tent revival meetings, the most prominent of which was Charles Finney. Finney called many to repentance, but as church congregations continued to grow and revivals spread, these were accompanied by the establishment of such unorthodox beliefs systems as the Mormons, the Spiritists, and the Millerites who spawned both the Jehovah’s Witnesses and the Seventh Day Adventists. Martin writes, “The traditional theology of Christianity was not of great interest to these seekers for answers, and they were susceptible to explanations which moved beyond the traditional Biblical basis of the various Christian faiths.”[i] Without a proper grounding for what orthodox Christian beliefs were and why the church held those beliefs, aberrant beliefs were able to grow and flourish, leading to lost souls not only in that generation, but for generations to come. Apologetics, though, encompasses the study of theology, especially as it relates to orthodoxy. If we are to defend our beliefs with reason and evidence, then it follows we need to know just what we believe and the reasons why we hold to those beliefs. Just as many of the modern cults we see today got their start from a lack of theological training, controversial teachings are even now creeping into the evangelical church. The Barna organization reports that although four out of five people classify themselves as Christian, “most people say Satan does not exist, that the Holy Spirit is merely a symbol, that eternal peace with God can be earned through good works, and that truth can only be understood through the lens of reason and experience.”[ii] Clearly, the church is being infected with faulty beliefs today, and apologetics is one discipline that will help stem that tide. This is why apologetics can be ministerial to the Christian in times of trial. I know in my own life I’ve dealt with some very difficult situations, including my wife facing a life-threatening condition. At those times, when I was praying and wondering why God would allow such things, I could hear the question of “Is God real? Is He really listening to you or are you just believing all this because you want to believe it?” creeping into my head. But I immediately remembered my apologetics training and said to myself “I don’t have to wonder about that. I know God exists; I know that Jesus really rose from the dead. I’ve already worked through those issues and I’m convinced of them. I may not know why God is doing this in our lives, but I can’t doubt that God exists. That question has been answered.” Apologetics was able to keep my trust I the Lord, even during the hard times. It is one reason why everyone needs to have an answer for their hope: everyone will face trials. We should strive to seek out these excellent things written for our learning and edification. Apologetics is a great way to do this. Although such study may seem difficult, it is necessary. Church leaders need to encourage apologetics to become more effective in their evangelism, but also to become more effective in their discipleship programs and more effective in their ministry to those in crisis. Believers should pursue a foundation in apologetics for personal edification, for assurance of belief, and to protect against the attacks of Satan through faulty doctrine or through doubt. Lastly, everyone should be able to rightly handle the words of truth so that, as verse 21 states “you may correctly answer him who sent you”. This verse isn’t saying that we must answer the unbeliever, but “him who sent you.” If we as Christians receive our calling from God, then it is the Lord who sends us and to the Lord we are accountable. So will you be able to answer Him correctly? Apologetics – necessary for discipleship training? In light of 1 Peter 3.15, and Jude 2 are we fooling ourselves when we say we are making disciples, but do not provide basic apologetic training? The biblical evidence is clear: All Christians are to be trained in apologetics, which is an integral part of discipleship.